That's quite late. Let's see next time. 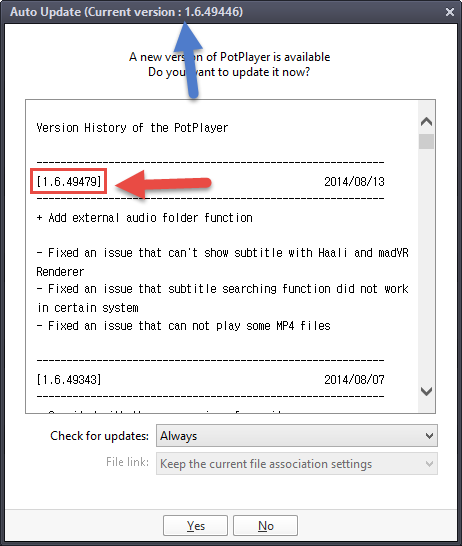 You can get the latest version 1.6.49479 on the Global Potplayer site. Just google "Global Potplayer" . However, I've tried this and was unable to get any audio. I played about with it for a bit but then uninstalled and reinstalled I.6.48576 which works perfectly. You did not understand my post it seems. I know how to get the latest version from the PotPlayer site. I have the English site bookmarked, and it has the latest version 1.6.49479, and I have downloaded and installed it. However, my point was that there is inbuilt update check built in PotPlayer, which is not working. As for your problem, it seems to be a local issue. The latest version is working well enough for me. Yup seems to be true. Probably the team has to work better with English version setup. Thank you. I just tried it and like it so far. It only misses DXVA support for my taste. And it is available for Linux. And maybe later being able to lower the subtitle font size (the show more characters of subtitle text on screen per line, like The KMPlayer does). Thanks for sharing Panzer. I liked the look of this as a lightweight MPlayer front-end. The program itself is quick to start and file-load times and subsequent resource usage are pretty good too. The audio extractor is a nice touch and something I could see myself using quite a lot if it were better implemented... at the moment it's just a bolt-on tool (you load the video separately rather than extract from the one you're watching and it lacks the ability to select just a section of video from which to rip audio). Winamp DSP is always useful to me but Exm crashes every time I try to point it to a DSP folder. For me it could do with the option of a more minimal interface (hide-able controls and menus etc) and the integrated social sharing buttons aren't something that appeals to me. Given that it's still pretty new though and still in beta, I'll probably keep an eye out to see how it develops. Hi Panzer, yes I know George has taken on a few pages here. I'm not sure I'd do a great job of reviewing and free time is an issue here as well but I do like to add comments about my personal experience with the software I try, in case it's useful to anyone. I'd be more than happy to hand over the article to one of the regular members here, and you should be perfect to do the job. It'd take me some time to review this category again, because of other articles that I've offered to review, so please contact MC and I'll wait till he gives me some info about it. "... in case it's useful to anyone ..." I am sure it is. A word of warning regarding RealPlayer. If you already have RealPlayer (or acccidentally installed RealPlayer, like this dummy did), you're gonna have a real arse-pain of a time getting all of the excess junk removed. RealAlternative will not be able to install the core components, even after uninstalling RealPlayer first. The uninstallation still leaves a lot of crap in the OS and various applications. Some of the crap still functions (or tries to, and instead hangs the OS/App). You'll have to do a lot of manual weeding to get most of the crap out, but even then, it won't be 100% clean. I ended up formatting my HDD and reinstalling my entire OS and Apps/Data. TWICE. Sigh, I should've set a restore point and/or made a mirror copy of the clean install of the OS and my core set of applications FIRST! People should only use the advanced features or Revo or any other uninstaller of this type if they have sufficient knowledge of Windows. Deleting items at random without understanding what else they might be associated with can damage your system. MC - Site Manager. Do you mean Real Player Cloud? That's its new name. Are you sure you downloaded it from the home site? Yeah, that's what I downloaded from the home site. The home site does not give you any choice but to download only RPC. Couldn't even find any links to download any older versions (EDIT: Without "Cloud".) at the time (late Feb/early Mar). Haven't been to the website since then. I forgot that I already had Real Alt Lite installed and downloaded the "real" Real Player (Cloud). Only remembered AFTER I installed, and from that point that's when I had all that problems with the imbedded stuffs. Ended up flushing whole hard drive twice with second time being a full formatting of ENTIRE hard drive including registry/system partitions. Really ticked off to point that I don't think I'll ever use Real OR Quicktime anymore. Used QT Alt Lite, but the updater slipped in a full install package of highly persistent apple bloatwares. Flush/Reinstall time again. If you gotta use QT, I'd suggest disabling or don't even install the Apple Application Support and manually update as needed by uninstalling and using the latest QT Alt installer. If there's any newer updates. Haven't seen any new versions since 2010. Been using Format Factory to convert the rare QT movies I get stuck with. Looks like I'll be using FF to convert any Real Player specific formats too. ...if I ever real-ly needed it in first place. Looks like ffdshow pretty much has it all covered anyway. Isn't that's whats usually bundled with MPC HC? PS: The links for QT and RP Alts goes to QT Alt 3.2.2 (last update 2009) and RP Alt 2.0.2 (last @ 2010). However, clicking on QTA Lite download link bounces you forward to QT Alt Lite 4.1.0, last updated Dec 2010. Which is still kinda old too. Reading the reviews there suggests that there may be some issues with even that one and the newer medias that are based on even newer versions of real QT. I just did a basic testing of Real Player Cloud in Sandboxie, and it isn't worth it. It didn't even found a place outside my sandbox onto my system. Basic video controls like adjusting the brightness, contrast and sharpness are available only in the premium version. It's all about the worthless Cloud features, and other extras like Cd-DVD burning etc etc...but as a video player, it's simply basic. I couldn't find a way to load the subtitles, I think you need additional plugins for that! Moreover it pop's up unwanted ads during playback. Not worth looking into. Cleaned up my sandbox. I'll make sure to test the product in a few days time, and report my results...It's still in my To-Be-Reviewed section. Thanks for sharing your experiences. SMPlayer is available for x64 edition. x64 version is available on the SMPlayer site. On the download page you need to click see more packages to get to the x64 version. So for SMPlayer, the line 32 bit but 64 bit compatible should be changed to 32 and 64 bit versions available. PotPlayer 1.6 has been released and is finally out of beta.. [It was already stable for me anyway] As mentioned before this is a global version with built-in localization support for English and no more translated versions are required.. At the end of installation in the last wizard you're free to choose if you want to install additional codec [By default it's ticked, I'd recommend to check it]. If you have the checkbox ticked, it'll download the required codecs but will still not install them. You're given a new wizard to install the codecs, and includes three files OpenCodec files, FFMpeg files and Libav files (I'm not sure why Libav files are separated from FFmpeg core as it already includes them). OpenCodec is enabled by default, you could choose if you want to enable the other two. (I can't live without FFmpeg anyway :D) FFmpeg is a complete, cross-platform solution to record, convert and stream audio and video. It includes libavcodec - the leading audio/video codec library. Advice: Uninstall older versions of PotPlayer on your system before you apply the latest global version. Thanks for this news, George. Is the download available from the DVB site itself? I just checked, and 1.6 is available as an update, and not as a major version. The major version there is still 1.5.45955. The update version is 1.6.47445. I installed the update, and on checking for updates from the program itself, it informs that a new version 1.6.47450 is available, which I guess is the new stable version. It's not available on DVB site yet though. Anupam this is the homepage of PotPlayer global version. Download it from the site. And you're free to update from within the player if you want from now on. http://potplayer.daum.net/ I'll update the download link in the article. Thanks GJ. I located the site from Google earlier, but there wasn't any version number. I will download from the site. The Update button at the top of the website next to language gives the latest version number and release notes. I believe the site is still under construction. Have a query. Now that a stable version of PotPlayer has been released, I guess more stable versions will be released from now on. Should we still install beta updates like before? Or, should rather wait for the stable version to be available? Even before the release of the global version of PotPlayer, it used to release stable versions. The so-called beta updates contained new features and when sufficient new features were introduced, and were found to be working perfectly well and doesn't break the player, they release the stable version. Due to the fast development times and release of beta updates of PotPlayer, I never cared to install them, because PotPlayer usually releases a stable version every 2 months, like it did in Jan, Mar and May. These stable versions included all beta updates in between them. Unless you're desperate to try out the new features across each beta update, I'd advise you to wait for each stable version across every 2 months.